Paleo Diet Flax Farm | Linseed Oil for your well-being. The paleo diet is becoming increasingly popular. Just a little linseed added to your ordinary diet helps to add the omega-3 and fibre to make it a bit more paleo. Our ancestors were hunter gathers, which means they eat animals they can catch and the eat plant foods they can gather. Hunting and gathering food required fitness and strength so our ancestors had to be athletes. For millions of years our ancestors evolved hunting wild animals and gathering a wide range of wild plants. The paleo diet aims to provide the food people evolved to eat. Except in times of famine their paleo diet was far richer than our modern diet in quality protein, vitamins and minerals, fibre, antioxidants and the essential fatty acids in particular a far higher ratio of omega-3 to omega-6 than we get in our food today. It contained far less starch, sugar, omega-6 and saturated fat. Linseed has been used by man from the earliest archaeological records. The stems of flax, a most superior strong fine fibre is nowadays used to make linen; our ancestors would have used it to make string, hold clothes on, fishing lines. The seeds we know they ate. Several places linseeds and flax fibre have been found in remains in the Middle East going back at least 30,000 years. The body of a man, dating from 15,000 years ago, found in a bog in what is now Germany had with him little cakes made from ground linseed. Plant proteins played a significant part in the diets of our hunter-gatherer ancestors. A paleo vegetarian or even vegan diet is possible and linseed being rich in omega-3 and protein makes a useful addition. Our ancestors would eat animals that had grazed naturally. The meat, eggs, milk, butter, etc we buy has mainly come from animals which have been fed grains so it has more omega-6 and not enough omega-3 d for health. In addition we tend to throw away the parts the animals rich of omega-3, their brains, eyeballs, spinal cord, bone marrow, testes and other unappetising parts, which further cuts down our omega-3 from the animal part of our attempt at a paleo diet. The ratio of omega-3 to omega-6 is important for health. If you are not going to eat brains and eyeballs you will need more omega-3; by adding Flax Farm cold-pressed linseed oil to your food you can increase your omega-3 to a healthier level. You’ve probably noticed that the supermarkets try to entice you to buy their veggies with descriptions like, tender, sweet, succulent, etc. Our modern fruit and veggies have been developed over hundreds, even thousands of years, they bear little resemblance to those our ancestors had to eat, which were tougher, more fibrous, less sweet but richer in antioxidants, vitamins and fibre. Flax Farm ground Linseed is an authentic versatile paleo food eaten by our stone age hunter gather ancestors and it helps add the all important fibre, polyphenols, lignans and antioxidants associated with wild plant foods. 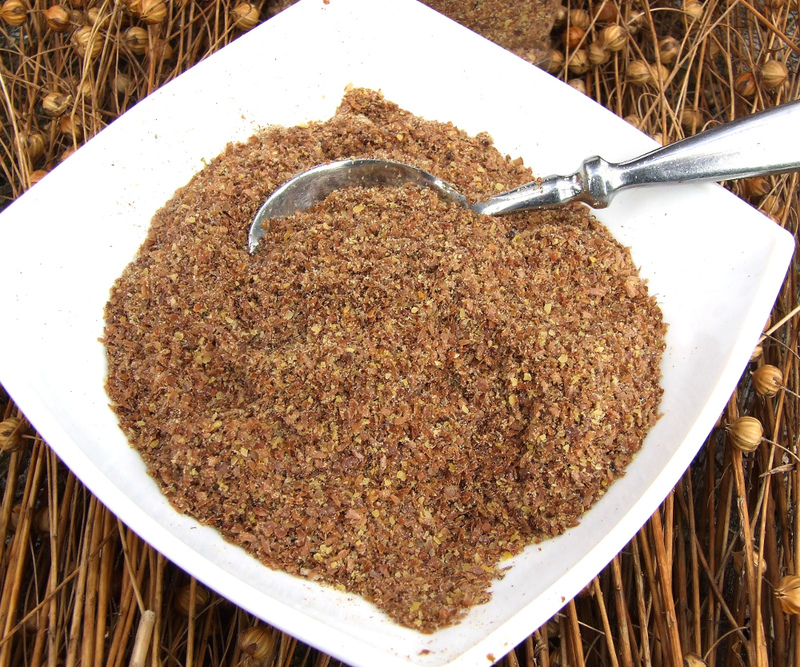 Additionally Linseed is a great food, tasty and filling like a cereal grain but much more nutritious and it is actually a food from the diet of our paleolithic ancestors. The high level of protein makes linseed (flax) useful food for vegan and vegetarian paleo diets. Whether you want a quick and easy, authentic addition to your paleo diet or want to make your paleo food more nutritious, higher in right sort of dietary fibre and the important omega-3 linseed (flax) is a healthy, tasty, authentic ingredient for the paleo diet. 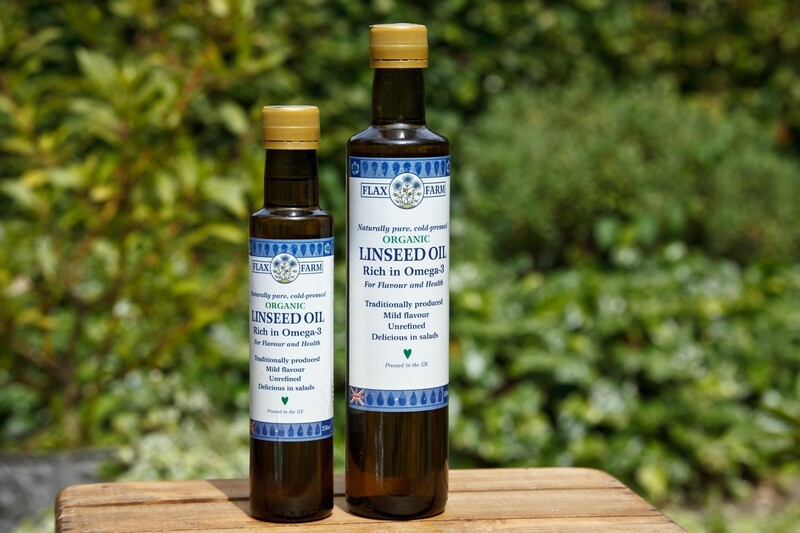 Flax Farm cold pressed linseed (flaxseed) oil and ground linseed are two best paleo ingredients. Although the darker linseeds are the original the light golden are every bit as good a good paleo food. Some Paleo purists prefer to start with whole linseeds. We find the best way to grind them is to use an electric coffee grinder. For ideas on how to prepare and cook linseed see Flax Farm paleo recipes, all simple, quick and easy. Includes: grilled meat or fish with linseed oil and herbs, carrot romesco sauce, pepper muhummara sauce, paleo porridge of linseed and berries, linseed and apple or rhubarb porridge, fruit and carrot paleo linseed muesli, paleo linseed bread, paleo flax crackers, paleo cakes.